Enabling customers to scan items in the aisle as they shop and then check themselves out and complete the payment process all from their mobile phone holds multiple benefits for retailers aiming to improve the in-store experience, cut costs and increase revenues, a new white paper from Rambus explains. 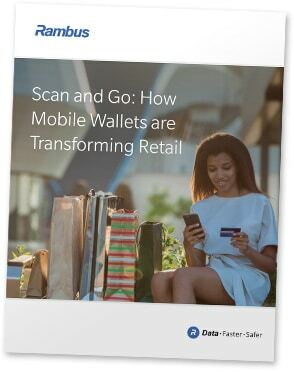 “Brick-and-mortar merchants are in the midst of a period of unprecedented disruption,” say the authors of Scan and Go: How Mobile Wallets are Transforming Retail. “Long-term structural trends mean that retailers must address decreasing revenues and escalating costs, while evolving the in-store experience to meet the demands of the connected consumer. Boost ARPU (average revenue per user) and loyalty, by improving in-store productivity, raising average spend and increasing consumer lifetime value. Enhance the shopping experience, by eliminating checkout lines and enabling staff to be redeployed across other store functions to improve the overall customer experience. Optimize operational efficiencies, by reducing losses due to customer frustration with traditional self-checkout solutions, cutting transaction processing fees by increasing the percentage of ‘on-us’ store-branded, closed-loop payments and reducing infrastructure costs by limiting the need to produce, manage, transport and store paper receipts, plastic cards, cardboard coupons and print advertising.